A substantial five bedroom detached family home situated in the desirable village of Thornborough. The property benefits from a refitted kitchen, refitted bathroom, refitted shower room, garage (part converted) a good size mature rear garden and parking for several vehicles to the front of the property. The accommodation fully comprises; Entrance hall with storage, downstairs refitted shower room, sitting room with log burner, refitted kitchen, utility room, dining room with French doors leading to the rear garden. To the first floor: Five bedrooms, refitted family bathroom and a further WC. To the outside: A good sized rear garden, garage (part converted) gate leading to a large lean to to, driveway providing plenty of off road parking. EPC Rating E.
Solid wood flooring, down lighters, stairs rising to first floor. Refitted to comprise fully tiled shower with shower and waterfall shower, low level w/c, wash hand basin with mono bloc mixer tap, a range of built in storage cupboards, under stairs storage cupboard, fully tiled to all walls, heated towel rail, extractor fan. Log burning stove with surround, coving to ceiling, radiator, Upvc double glazed window to front aspect. Solid wood flooring, coving to ceiling, radiator, Upvc double glazed window to rear aspect, Upvc double glazed French doors to rear garden. Refitted to comprise a range of base and eye level units, sink unit with mono bloc mixer tap, cupboard under, granite work surfaces over, tiling to splash areas, space for Aga cooker, tiled floor, down lighters, door to rear, cupboard housing boiler serving both domestic hot water and central heating, Upvc double glazed windows to rear and side aspect. (Part garage conversion) A range of base and eye level units, sink unit with mono bloc mixer tap, cupboard under, work top over, space for: dryer, additional fridge, freezer and space and plumbing for washing machine. Access to loft space, coving to ceiling. A range of built in wardrobes with rail and shelving as fitted, coving to ceiling, radiator, Upvc double glazed window to rear aspect. A range of built in wardrobes with rail and shelving as fitted, coving to ceiling, radiator, Upvc double glazed window to front aspect. Refitted to comprise a fully tiled bathroom, bath with mono bloc mixer tap, shower over and shower screen as fitted, low level w/c, sink unit with mono bloc mixer tap, airing cupboard with storage as fitted, heated towel rail, down lighters, extractor fan, Upvc double glazed window to front aspect. 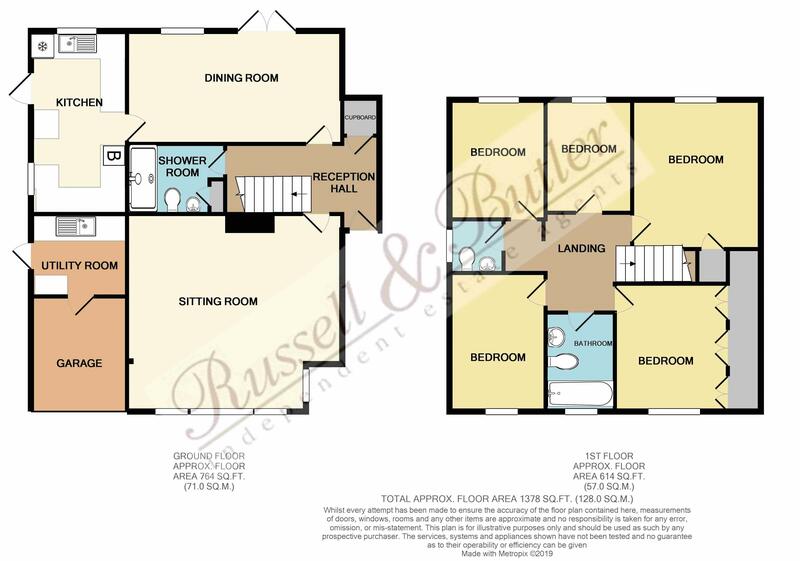 Low level w/c, sink unit with tiling to splash areas, Upvc double glazed window to side aspect. Laid to lawn with pathway leading to property entrance, driveway providing off road parking for several cars, double doors leading to a lean to storage area, outside light. Laid mainly to lawn with paved patio area, a range of flower and shrub beds, pond, two storage sheds, wendy house, greenhouse, lean to storage area, oil tank, outside light, outside tap. All mains services connected with the exception of gas.